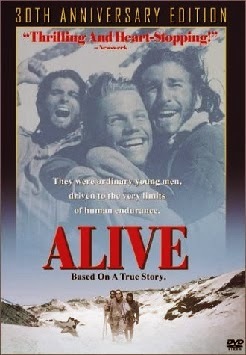 Documentary: "Alive: 20 Years Later"
Featurette: "Return to the Andes"
On October 12, 1972, a rugby team from Uruguay flew over the Andes Mountains to play a team in Chile. They never arrived. The plane loaded with 45 passengers and crewmembers crashed into the side of a mountain and crashed. 72 days later, 16 survivors would be rescued. Their lives were changed forever. Stranded on a glacier, the survivors resorted to cannibalism to survive. Given the subject matter involved, there are two types of films that could be made from this story. Both films have been made. "Survive" was an exploitation film that came out a few years after the actual events. "Survive" focused on the cannibalistic acts. I remember when these events happened. My 14-year-old mind was repulsed and drawn to the story. I have a vague memory of seeing "Survive" at a drive-in theater back in high school. The movie was a Herschel Gordonesque hodgepodge of gore and agony. "Alive" is the second type of film that could have been made from these events. "Alive" deals with the cannibalism in a straightforward, non-exploitive manner. The focus of this film is spiritual growth, camaraderie and heroism. Ordinary people striving under extraordinary circumstances has always had the making of good drama. "Alive" almost achieves greatness, however, the limitations of the medium prevent the viewer from truly understanding the inner changes these men went through. I enjoyed "Alive" but rather than satisfying my hunger for knowledge about these events, it merely made me want to read a book on the subject. The film is beautifully photographed, and includes some good performances. 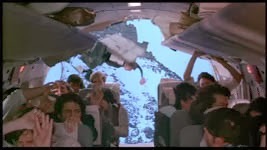 The plane crash at the beginning of the movie is one of the scariest scenes ever put on film. I have never been able to shake from my mind the images of people spilling out of the back of the doomed aircraft, still belted into their seats. 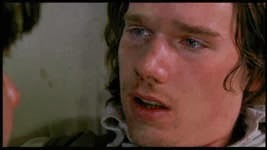 Ethan Hawke and Vincent Spano are good as are most members of the large ensemble cast. Good movie. Excellent picture and sound. Good extras. Fair price for what you get. Great soundtrack. The harrowing plane crash scene is a fine example of how great the soundtrack is. The engines of the plane struggle to bring the plane up. Once the plane is cut in thirds by the initial impact, the silence, which replaces the motorâ€™s hum, is truly frightening. The whir of the wind rushing through the cabin as the plane plummets to the ground gave me Goosebumps. I watched that scene several times. Proof that sound adds so much to the visuals. Nice balance between the ranges. No distortion in the low ranges. The sub-woofer is integrated very nicely with the rest of the channels. "'Alive': 20 Years Later" is an hour-long documentary made during the production of the film. The bulk of this documentary deals with the real life survivors of the "miracle of the Andes." Numerous new interviews, archived stills and news film and behind the scenes looks at the making of the movie make this extra feature almost worth the price of the DVD by itself. This documentary adds a layer of depth the movie itself didn't achieve. "Return to the Andes" is a short, but moving featurette. Nando Parrado, (portrayed by Ethan Hawke) makes a trip back to the crash site via a mule-team expedition. The journey covers, in reverse, Parrado's path to rescue. The 8-minute film is beautiful in both its scenery and spirituality. The introduction by director Frank Marshall is useless. He talks for two minutes. Why not take the time to do a commentary track? A simple, but powerful menu design. A red screen with the movie's title on which a rotating menu of words and definitions appear. The words deal with the film's central issues: tragedy, courage, etc... Easy to navigate. Nice use of sound. The lonesome, unrelenting sound of wind through the mountains repeats over and over. I liked the movie. I found it inspirational and exhilarating. The extras fill in some of the voids left by the movie itself. Worth the price of admission.